0% Introductory APR for 12 billing cycles for purchases and for any balance transfers made in the first 60 days, then, 13.99% - 23.99% Variable APR. 3% fee (min $10) applies to balance transfers. You know that cash back credit cards can work for you, but there is the rare card that can both work for you and support a cause you care about. The Susan G. Komen® Credit Card from Bank of America is one of those cards. Bank of America, in conjunction with its Pink Ribbon Banking credit card and checking program, has pledged $3 million by 2020 to Susan G. Komen®. As part of that program, for every Susan G. Komen Card that remains open and is used within the first 90 days of account opening, Bank of America donates $3 and $.08 for every dollar spent on the card. So, now you know how this card benefits an organization you care about; what about how it benefits your wallet? To start with, you can apply for the card online and earn a $200 cash back bonus after making $1,000 in purchases within the first 90 days. 3 percent cash back in the category of your choice: gas, online shopping, dining, travel, drug stores, or home improvement/furnishing. 2 percent cash back at grocery stores and wholesale clubs (up to $2,500 in combined choice category/grocery store/wholesale club quarterly purchases). unlimited 1 percent cash back on all other purchases. You can update your choice category for future purchases once each calendar month using the mobile banking app or online spending heavily in one of the highest reward categories, this card could really be a boon to your wallet. And if you are a preferred rewards client, your cash back bonus could increase anywhere from 25-75 percent. This card is obviously one that appeals to the credit card user who wants to show their support for Susan G. Komen, but what's nice about the Susan G. Komen® Credit Card is that you can support an organization you care about with a card that's also smart for your own wallet. And not only smart, but secure. For the ninth year in a row, Bank of America has been recognized for its fraud prevention, detection and resolution with a Best Overall Identity, Safety in Banking Award from Javelin Strategy and Research. With no categories to keep up with or enrollments to remember, the Susan G. Komen® Credit Card is an easy card to have. Plus, there’s no annual fee and your rewards don’t expire. Shop safe®, which helps protect you when shopping online. Access to Bank of America financial centers and ATMs. As if all of this wasn't enough, the Susan G. Komen® Credit Card is currently offering an introductory 0-percent APR on purchases for the first 12 billing cycles and a 0-percent introductory APR for 12 billing cycles on balance transfers made within the first 60 days of account opening (then, 13.99% - 23.99% Variable APR on purchases). If you're looking to make a substantial purchase or consolidate your credit card debt, this could be a card worth checking out. The Susan G. Komen® Card's top rewards categories are gas and groceries – if those aren't your top spending categories, than you won't realize the full potential of this card. Additionally, even with the 0 percent APR for 12 billing cycles on balance transfers (before 13.99% - 23.99% Variable APR on balance transfers), there is a balance transfer fee to figure in: $10 or 3 percent for every transfer, whichever is greater. If you anticipate needing to make several balance transfers, there are cards that offer introductory periods without transfer fees. 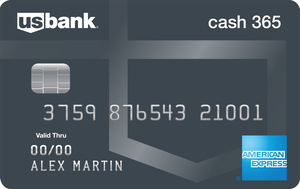 Susan G. Komen® Credit Card vs. Blue Cash Everyday® Card from American Express. The Blue Cash Everyday® Card from American Express (See Rates and Fees) also offers tiered rewards categories that do not rotate. They are slightly different from those offered by the Susan G. Komen® Credit Card, however – 3 percent at U.S. supermarkets (on up to $6,000 spent annually, then 1 percent), 2 percent at U.S. gas stations and select U.S. department stores and 1 percent for other purchases – so it's possible the Amex categories fit better into your everyday spending. With the Citi® Double Cash Card - 18 month BT offer you can earn cash back twice on every purchase with 1 percent cash back when you buy, plus 1 percent cash back as you pay for those purchases (whether you pay your balance in full or over time). Two percent cash back by the time you've paid off your purchases is pretty great, but it isn't as high as the cash back you can get with the Susan G. Komen® Credit Card– that is, 3 percent cash back in the category of your choice: gas, online shopping, dining, travel, drug stores, or home improvement/furnishing. Susan G. Komen® Credit Card vs. Fidelity® Rewards Visa Signature® Card. 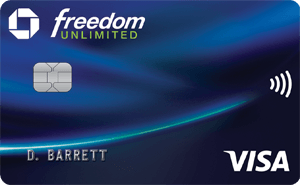 The Fidelity® Rewards Visa Signature® Card, like the Susan G. Komen® Credit Card, offers a non-rotating rewards structure in a card without an annual fee. With the Fidelity® Rewards Visa Signature® Card, you can earn 2 percent cash back on every purchase, which means this could be a better fit for cardholders who don't spend a lot in the gas category that earns the most with the Susan G. Komen® Credit Card. On the other hand, the Fidelity® Rewards Visa Signature® Card only allows you to redeem your rewards into a Fidelity account like a 529 or 401K or through the WorldPoints program. The Susan G. Komen® Credit Card could be just right for the person who likes to feel good about their credit card spending; in this case, your purchases directly benefit Susan G. Komen® and earn you cash back in popular everyday categories. This is also a card worth considering if you're already a Bank of America or Merrill Lynch customer and can cash in on those bonuses for redeeming your rewards into an eligible account. Any time you redeem cash back into a Bank of America checking or savings account you earn a 10 percent customer bonus. The rewards earning structure is simple and is geared particularly toward everyday purchases. When you use the Susan G. Komen® Credit Card, you'll be giving back. 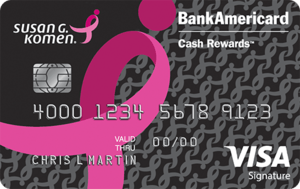 Bank of America donates a percentage of all purchases on the card to the Susan G. Komen® Foundation. Certain terms apply. A card like Chase Freedom® offers higher rewards earning potential if you're willing to keep up with rotating cash back categories and aren't particularly interested in your purchases benefiting a nonprofit.